France vs Croatia is the final moment we have been waiting for. It’s the FIFA World Cup 2018 final match of the tournament. 2018 WC live streaming, score, latest updates, highlights, playing xi lineup, etc. all are provided here. The complete info you would need before the showdown game begins. 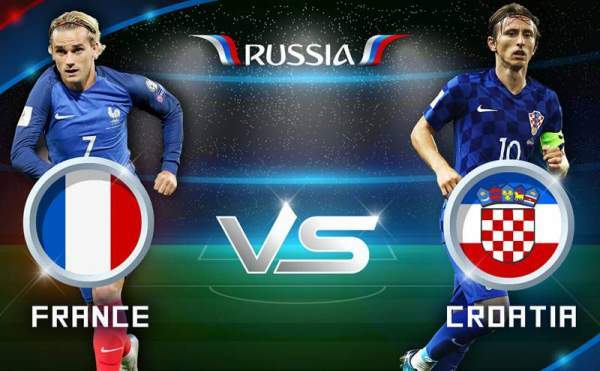 On Sunday, July 15, France and Croatia will face off each other in the world’s most-watched world cup sports tournament. This edition of the football WC was played in Russia. The two teams have turned out to be the best among their competitors. Today, one of them will win the trophy for their nation. In 2018 FIFA World Cup, France was regarded to have one of the best squads since the beginning of the WC. They have proved it right and reached the final stage with back to back straight victories. But, Croatia took a little more time and won on the basis of Extra Time and penalties along the way. The French coach Deschamps has got an opportunity to win a trophy as a coach and gets his name written in the history books. For Croatia, they have got a perfect chance to win their first ever world cup in the history. France won its first WC trophy in 1998, now it’s their second chance to get it. This worldcup tournament has thrown some of the epic twists and turns around the corners. It witnessed the falling of some of the giant teams like Argentina, Brazil, Germany, and Spain. England and Belgium impressed throughout the series. This final game will start at 8:30 pm IST/11 am ET and will be played at Luzhniki Stadium in the capital city of Russia, Moscow. France: Lloris, Pavard, Varane, Umtiti, Hernandez, Pogba, Kanté, Mbappé, Griezmann, Matuidi, Giroud. Croatia: Subasic, Vrsaljko, Strinic, Lovren, Vida, Rakitic, Modric, Brozovic, Perisic, Mandzukic, Rebic. The live telecast will be on Fox, Sony Ten 3, Sony Ten 3 HD, and Telemundo. You can catch the live updates via free online stream via fubo.TV, FoxSports.com, Fox Sports Go app, SonyLIV.com, SonyLIV app, etc.